The first few words of every story are always the hardest. It's almost as if pulling them out, speaking them into existence, commits you to seeing it all the way through. As if once you start, you are required to finish. There's hardly a moment in any given day that I don't want to pick up a book. But there are times that not just any book will do. I sometimes feel a need, almost a desperation, to be emotionally destroyed by a book. To be pulled so deep into the brink of sorrow and heartache that I'm practically drowning in it. So far down that I'm not at all sure it'll be possible for me to reach the surface again. I'm always surprised when someone, an author, is able to evoke those kinds of feelings, emotions within me. 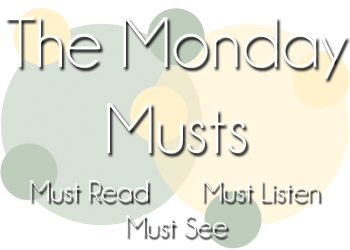 When I started feeling that craving coming on recently I instantly knew that Amy Harmon and The Law of Moses were going to fill that need for me. I'd previously read her book Making Faces which did all of those things for me while also sprinkling in bits of warmth and happiness, so I was feeling pretty confident. If anything, The Law of Moses probably even made me feel a tiny bit more. It was really hard for me to put a label on this book when it comes to genre, because at it's heart it's Contemporary, except there was this huge part of one of the characters, and who they were, that was heavily influenced with the Paranormal and/or Supernatural. So I guess you could kind of view it either way. No matter what label you throw on it though the one thing that matters is that Amy Harmon is a brilliant author. She strings together all these words that paint these beautiful images in your mind. Images of tragedy and loss and breaking, of love and mending. Whatever it was, when Moses came to Levan, he was like water—cold, deep, unpredictable, and, like the pond up the canyon, dangerous, because you could never see what was beneath the surface. And just like I'd done all my life, I jumped in head first, even though I'd been forbidden. But this time, I drowned. Just like Georgia, I found myself quickly drowning in Moses. I seem to gravitate towards the broken and Moses could not have been more so. I found myself completely fascinated by his character and constantly wanting more of him. Every time we got to be in his point of view would end up pulling me deeper into his character. The only downside to that was that it could be so heartbreaking at times. Knowing exactly from his own mind how deeply he viewed himself as nothing or worthless or...I don't know. It's really hard to put into words. He made my heart heavy and I just wanted to hug him, convince him he was wrong. "I'm a very ordinary girl, Moses. I know that I am. And I always will be. I can't paint. I don't know who Vermeer is, or Manet for that matter. But if you think ordinary can be beautiful, that gives me hope. And maybe sometime you'll think about me when you need an escape from the hurt in your head." My love for Georgia was right up there with my love for Moses. I loved her small town, country girl attitude. I loved her heart and compassion. I loved her tenacity, her complete and total stubbornness. I think what made me love her the most was the fact that she saw something beautiful and worth knowing in Moses. Something that goes beyond the pretty yet intimidating outer package. When everyone else was afraid of him and automatically assumed the worst, Georgia believed in him and ran towards him instead of away, hard as he tried to push her away himself. Like I said there was a paranormal aspect to Moses's character that was a complete surprise to me. Normally surprises like that, going in expecting one thing and getting another, end up irritating me but it had the complete opposite effect in this case. It added so much more to this story and added this deeper emotional element that, in my opinion, it wouldn't have had without it. I feel so cryptic with not telling you what was so special about Moses but I really think it's one of those you need to read to find out things. 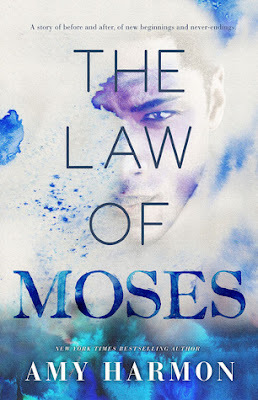 The Law of Moses was everything I was needing and expecting from an emotional read. It also surprised me at every turn. The characters are complex and complicated in all the best ways. I found it impossible to put down and found myself dreading the final chapter. I wish I could've stayed in this world and with these characters for just a little bit longer. If you love a book that will turn you upside down and inside out then I highly recommend this one. The W...W...W...Wednesday that I'm going to be following and linking to has been slightly modified by Jessica from Lovin' los libros from it's original that is currently hosted by Taking on a World of Words, to include a book that we're waiting to read, either new release or just one that we're waiting to get to! I am currently alternating through both of these books. I don't want to not read. And I feel like if I tried to binge just straight through the Under the Never Sky series then I'd have long periods where I just don't pick up a book. I've read a lot of fantasy/sci-fi over the last few months and so I've really been needing to break that up a bit before I get sick of it and stay away from it entirely. Though I probably should have mixed it up with some other contemporary because now I think I'm too hooked on the Marked Men! Loving both though!! My favorite marked man from the series forever has been Rome Archer. And while Nash didn't quite bump him off his throne that rules over my heart, he did come pretty freaking close. Loved Nash's story! Loved. So what are all your picks for this week? 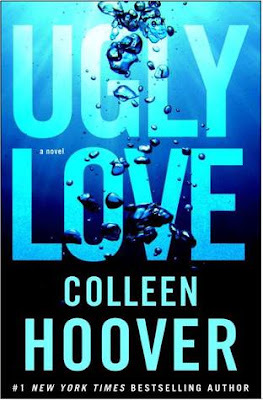 Why, Colleen Hoover? Why? Why do you constantly insist on pulverizing my feelings? It's okay. I still love you. I always think that I'm emotionally ready to pick up one of her books. Yet every time I do she proves to me how wrong I was. I thought I had some idea where things were going to go with Ugly Love and for the second time in this paragraph, I admit that I was very wrong. Maybe the lesson here is I need to just stop thinking altogether. Even though I'm a person who believes that the whole "friends with benefits" thing, or I guess in the case of Tate and Miles acquaintances with benefits, will never, ever work, I absolutely love reading a book with this trope. They always seem to prove my point that for at least one person in a relationship of this type, feelings will inevitably be impossible to avoid. You can tell yourself that you won't get your heart involved but I always feel like it's an impossible mission. I don't know, maybe I'm just not a cold enough person and I'm too much heart. But regardless on how you view the FWB game...I'm addicted to reading about them. Loved both Tate and Miles. Granted, I had moments of pure and utter frustration with both of them from time to time as I made my way through their story. In the case of Miles it was his constant mixed signals. He would preach one thing but his actions would say something completely different. Had I ever at any point felt like he was doing this on purpose I would be writing a totally different review all together. However, it's practically impossible not to love Miles, especially as the story goes on and you learn his deep dark secrets. Then that practically slips away and it's just inevitable. Miles's story completely ripped my heart to pieces. It was dust. Like, I am surprised there was anything left of it to put back together. He is my new favorite Colleen Hoover book boy! Tate was also a really great character. Tate was essentially every single girl who's met a great guy and walked into a situation with her eyes wide open, knowing all the rules...and couldn't help but break every single one of them. Which I guess is why at times she could be so frustrating. She did stupid things because of a boy she lost her heart to and sure at times the relationship was pretty unhealthy but I respect every direction her character went in. Why? Because it was so damn real. She saw something in Miles that was worth all the heartache, tears and pain and we do crazy things when we're in love. Therefore, I loved Tate and how real she was. I really don't know where else to go from here. So I guess it's time to just go ahead and wrap this one up! There is something so addicting about picking up a Colleen Hoover book. You know it's bad for you (emotionally), you know it's going to hurt you. It's not going to be fluffy and puppies and rainbows. Yet like every addict out there, getting your hands on that next fix is so satisfying and you can't wait to lose yourself in the moment and ride the high it gives you. Ugly Love toyed with my emotions and I can't even hate it for that. It was beautiful and heartbreaking and heartwarming all at the same time. And I loved every single emotion and feeling it pulled me through. I'm already ready for my next CoHo fix. Okay, so you need to be warned right now. If you are watching the Shadowhunters and are not yet caught up through episode 12** you will need to stop before you hit my "Must See" section. Don't worry I will leave plenty of space so that you can get up to my "Must Listen" without seeing what comes next so you can close it. But after watching that episode this weekend I've sort of got a one track mind and I don't want any complaining about *spoilers*. On with the showwwww! ** I guess maybe also if you haven't read TMI yet and eventually want to...I should cover all my bases! I read these first 3 books in The White Rabbit Chronicles at the end of March and became pretty obsessed. It was a series that, for me at least, really did a number on my feels. It brought me to incredible highs and then the types of lows that had me yelling at my Kindle and leaving status updates on Goodreads that were basically all caps. Yeah, I got pretty invested haha. This song has been stuck in my head for a freaking week. This is not a complaint! I found it through the Discover Weekly playlist on Spotify back in 2015 and it's probably one of my favorites that I've "discovered" from there. A few days ago my kiddo gets out of the shower and comes downstairs as I'm singing it very loudly and of course when I see him I then start singing even louder to him. He stops and I'm about to laugh because I was expecting "Mom, just stop..." Instead what I get is "...what the crap? I was just listening to that..." and a look like this O_O Apparently he was gonna try to introduce me to this one as well. This is your last chance to avoid Shadowhunter/TMI spoilers. I am unapologetically addicted to the Shadowhunters show on Freeform. Is the show amazing? No. Is the show great? Not really. Is the show...pretty good? Sure. I'll give it a pretty good. In a nut shell? There are about a zillion things that bug me. Stuff is all out of timeline and some things are just wrong. Even when I try to separate show from books and just look at it as a show, there are still things that bug the ever loving crap out of me. "So why do you watch it Sheri?" I'm glad you asked person who is being completely nosy and stuff! Basically...if it's Shadowhunter related, apparently I become instantly obsessed and will watch it no matter how painful it is. If this show lasts for 20 seasons and never improved I would probably be watching all 20. It's a sickness people. And...I don't care. I've even rewatched the movie, which I hated....twice. This is what it means to have an addiction! I have no control over what my heart makes me do! What can I say? It's starting to grow on me. So, episode 12, basically I died. My heart couldn't handle the ending-ish. If you watched you know where I'm going with this. I freaking can't either Alec!! Gah! I'm sorry (not really). I just couldn't stop. I had a couple more too. Have I presented you with enough GIFs yet? Okay! I swear! I'm done. Malec finally happened on screen! I really am (not) sorry for the GIFsplosion. I can't promise for sure that something like this will never happen again but I can give you my word that I will give it my damnedest not to. But every once in a while I need to feed the inner fangirl. She gets hungry! I feel like for the first few months of doing this that I've done really well with setting realistic goals for myself. 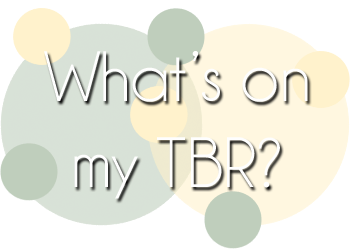 Proof being that I actually read everything on March's TBR and then some...a lot on the some. For April however, I'm throwing that safe and realistic attitude out the window. See, I've found myself in a position once again where I have accumulated so many books that are first in a series a good number by authors I have never read any books of yet. I'll see something that intrigues me and think "Ohh! I want to try this!" Except they're building up like crazy now and so I've decided that I'm just gonna spend the next few months trying new things! So there are going to be a huge pile of books on this TBR and hopefully I'll clear out a lot of them and whatever is left will add on to May along with probably some new ones, and so on. My Series a Month for April will be the Under the Never Sky series which I am excited to finally read. And besides that my biggest priority will be finishing the Marked Men, The Bane Chronicles, Fangirl, The Selection (so I can get it back to the library), Us, and then just pick off all of the first books in series one by one and get in as many as I can. 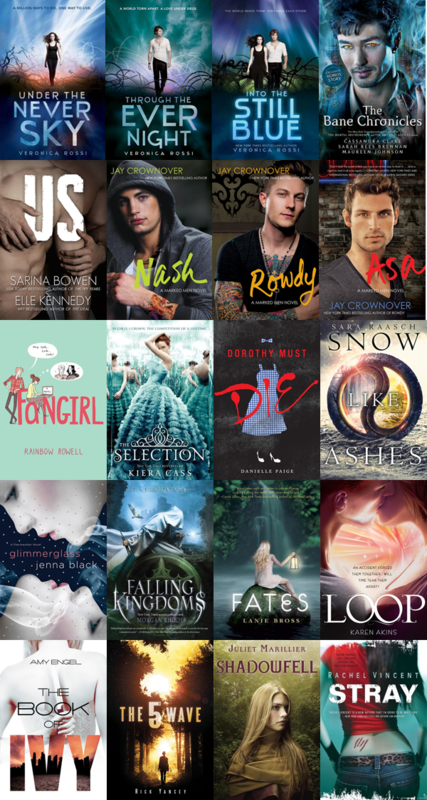 So I'm really, really excited to start tackling April's TBR! I'm sure I'll be rubbing the sleep out of my eyes as I crack open the first book and start on my mission! Are there any books that you're looking forward to getting read in April?